EZWebGallery | The Free automated web gallery generator. The Free automated web gallery generator! EZWebGallery has a high level of usability and allows you to quickly generate standard compliant photo web galleries that can be browsed on any desktop or mobile device. EZWebGallery is quite easy to use. In a few click, beginners are able to generate outstanding galleries. More advanced users can personalize their galleries, as they are fully skinnable. Read our "Quick Start" guide and let's begin! EZWebGallery put emphasis on quality and makes no compromise when processing the photos which will compose your galleries. Pictures are automatically resized to make the best use of your visitors' screen estate and are loaded lightning fast, thanks to our "smart prefetcher". 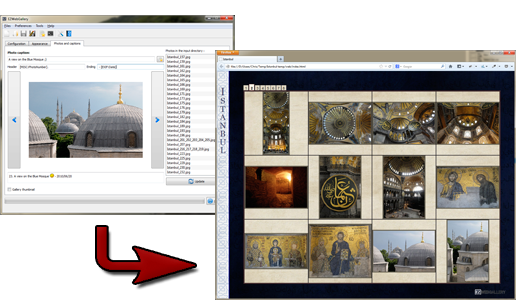 EZWebGallery works equally well on a PC running Windows and on Ubuntu. Based on Qt and being open-source, it is portable to other platform. A MacOs X version is on its way!